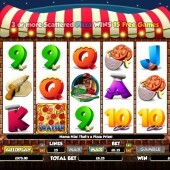 Pizza… slots… what is there not to love about slot developer NextGen Gaming’s release Pizza Prize? Whoever came up with the idea for this slot is both a genius and an idiot. A genius because everybody loves pizza and an idiot because all you will want to do after playing this slot is ring up Dominos and get a delivery sent out! This slot is a 5 reel, 25 pay-line slot and you know what you’re in for from the very start. The symbols consist of all things pizza-related including pizza ingredients, pizza dough, a delivery boy and the regular 9 through to Ace symbols. The developer really has done everything it can to make it feel like you're in a pizzeria in the middle of Naples! Tony is Wild About Pizza! The Wild symbol is represented by Tony the pizza man and he substitutes for all other symbols, except for the Scatters, to complete winning combinations and give you the opportunity to earn decent pay outs. There are free spins to be won on this slot and the free spins bonus round is triggered if you hit three or more of the pizza Scatters across the reels. You will immediately be rewarded with 15 free spins and there is the chance to re-trigger these free spins by hitting three or more Scatters across the reels during the free spins. There is also the joy of you being awarded random Wilds and random multipliers up to a value of 5x during the free spins. 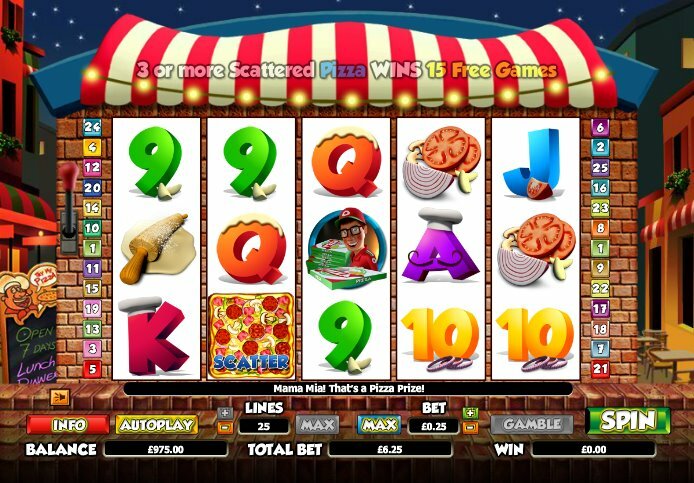 During the free spins, an oven appears above each reel and if a pizza Scatter symbol appears on that reel then the oven on that reel will open to reveal a prize of a Wild, additional free spins or a random multiplier. NextGen Gaming are one of my favorites slot developers and I’ve enjoyed their previous releases including the amorous Doctor Love slot and the Oriental-themed Emperor’s Garden slot. This is a fine addition to their collection and one slot that I can honestly say will be getting played a lot in the future by myself.